soaps & telenovelas – ¿Y Ahora Que? To learn a new language, immersion is the key. For me, immersing myself in Spanish is just not going to happen unless I live in a different country. But there are things I can do to help. One of those things is watching some Spanish language TV. Something full of body language is right about at my level. So, a telenovela it is. Spanish language soap operas are unlike ours in that the story is not endless. They’re more like a mini-series and less like All My Children. 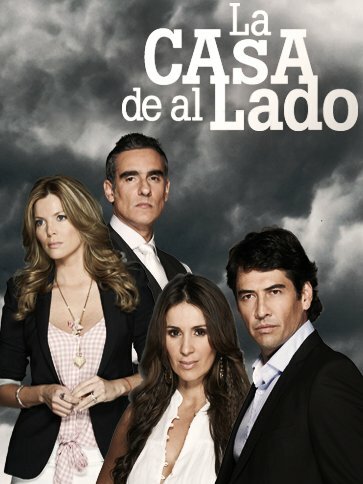 So flipping through channels one evening I landed on Telemundo where La Casa de al Lado sucked me in. There’s a ghost, an evil twin, a beautiful mute quadrapalegic who knows too much, a scheming housekeeper who thinks she can speak English, and layers upon layers of intrigue. As if this wasn’t enough, the entire production is drenched in dramatic music. “¡Usted está vivo!” (cue music) Bum-bum-BUUUUM. “¡Usted no es mi madre!” Bum-BUM-BUUUUMM! “¡Es martes!” BUM-BUM-BUUUUUUUMMMMMM! In fact, the music is so over-the-top I can hardly hear what the characters are saying, Not really ideal for language learning. Meanwhile Netflix suggested I would enjoy “장난스런 Kiss“, a Korean mini-series. There’s a cheerful girl, heartless boy, goofy side-kicks and a long drawn-out story of unrequited love. My inner-13-year-old is thrilled. (Oh Netflix, you know me) The music is cheesy Korean pop, but at least I can hear what the characters are saying. And, much to my surprise, I understand a lot of it. I’m 7 episodes in and feel like I can turn off the subtitles without missing much. This is part of my problem when trying to learn Spanish; any time I’m struggling for a word, I automatically throw something Korean in there. I guess it’s an argument for total immersion. Although I took 2 years of Spanish in high school and a few casual classes since, it’s those 3 years of living in Korea that really ingrained the language. This, despite the fact I was teaching English all day. So while I figure out how we can move to a Spanish speaking country, I’d better watch more telenovelas. What are your favorites? Any with less Bum-BUM-BUUUMMM and more cheesy teen romance? a little extra? or too much? I did that too (replacing words I don’t know with another language)! I am a native English speaker who became fluent in Spanish through school (middle, high school, and majoring in Spanish in college, as well as studying abroad twice). But I also took Portuguese and German in college. I would find myself using Spanish words in Portuguese class, but that sort of worked because they are very similar languages! However I also used some random Portuguese or Spanish words in my German class… and just had a blast laughing at myself. One of my mottoes in my 1st grade classroom is that you need to learn from mistakes, and it’s even better if you can laugh at your own mistakes and talk to native speakers who will laugh with you (not at you).